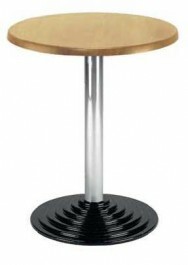 Table base is a chromium plated single column with a cast iron foot black powder coated. Compatible with 60 cm dia, 80 cm dia, 90 cm dia and 80 x 80 cm table tops. Table height suited to standard cafe chairs.